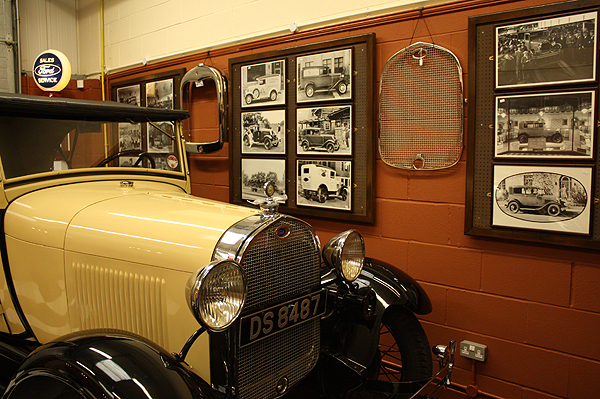 Yes, the new series of Car SOS starts this Thursday 14th Feb 2019. One of the episodes in series 7 features the team rebuilding a Model A Ford. 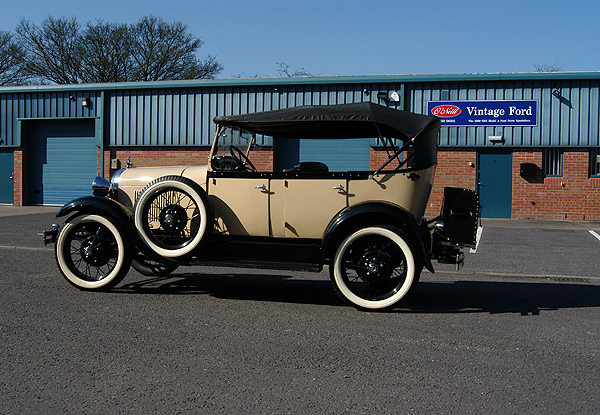 Car SOS presenter Fuzz Townsend gave me a call, asking if I would give the car a look over, as they are not usually working on something quite as old as a Model A. 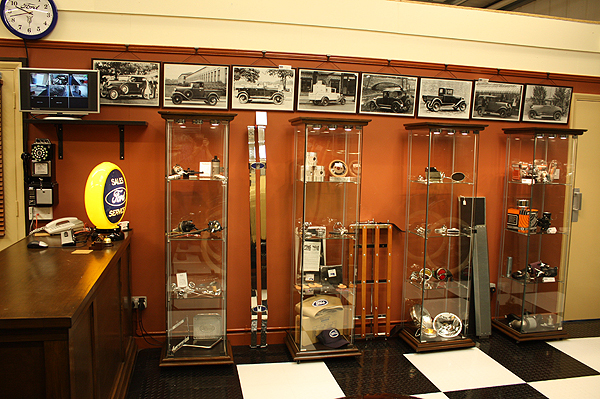 In the end, we supplied a shed load of parts for the build, which came together in an amazingly short timescale. 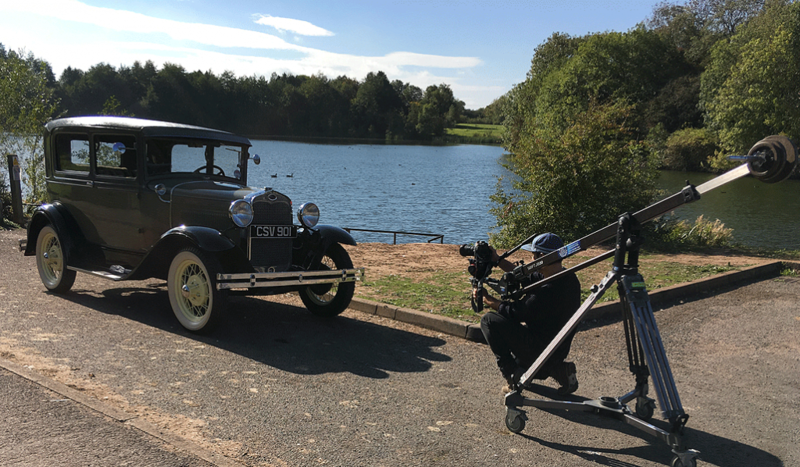 When the programme producer asked me if they could feature our 1930 Model A Sedan in the opening sequence, we gladly agreed. The programme Director and film cameraman came over for the day. 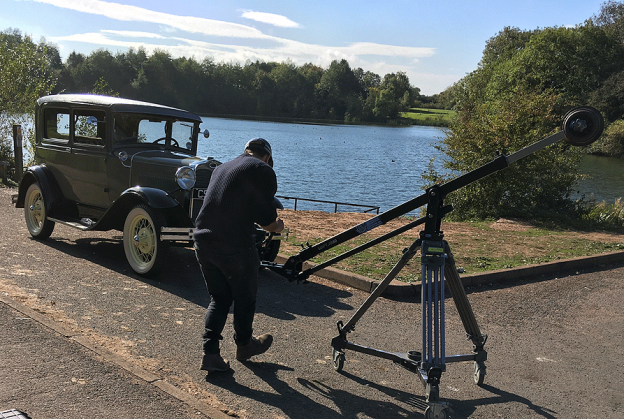 After a few hours spent shooting a ton of still footage, they tucked themselves neatly into the nearby hedges with their TV cameras, while I repeatedly drove up and down a local country road. It was a great experience and I really appreciated my company being invited to help in the project. Car SOS series 7 is first shown on the National Geographic channel, before hitting Channel 4 later in the year. 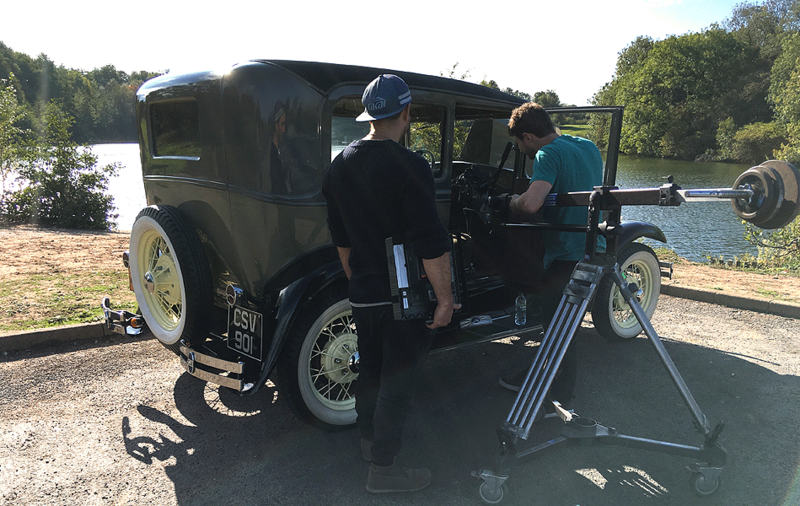 The Car SOS crew, filming our Model A Sedan. 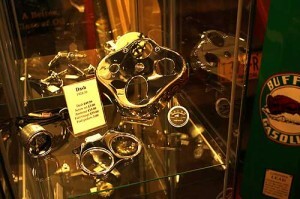 This entry was posted in Uncategorized on February 11, 2019 by David O'Neill. 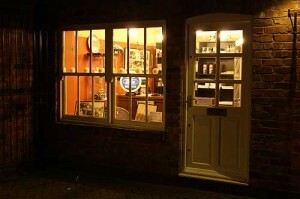 Yes, we have finally moved into our new premises in Coalville Leicestershire. 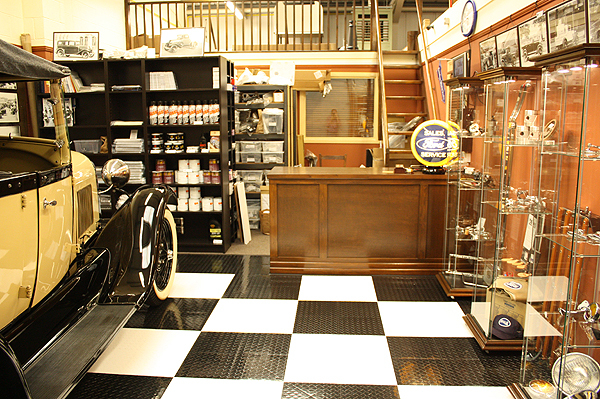 To give our showroom some razamataz, we laid a cool Racedeck floor, which was quite straight forward to lay and gives a fabulous glossy finish. Anyone who has visited our Ashby store would have seen that we used period colours, to give a 1930’s theme. Well, we did our best to recreate the same feel, but on a bigger scale. 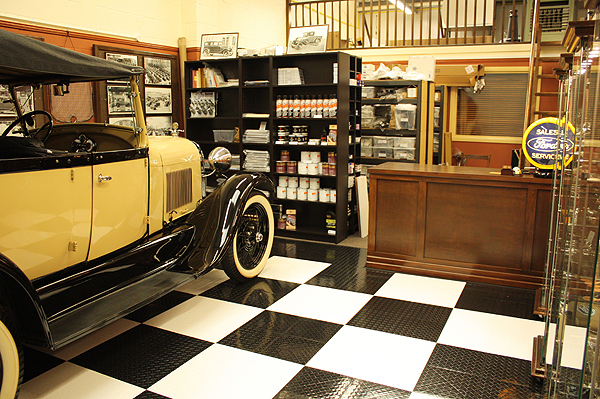 Our 1929 Model A Phaeton fits in the showroom nicely. 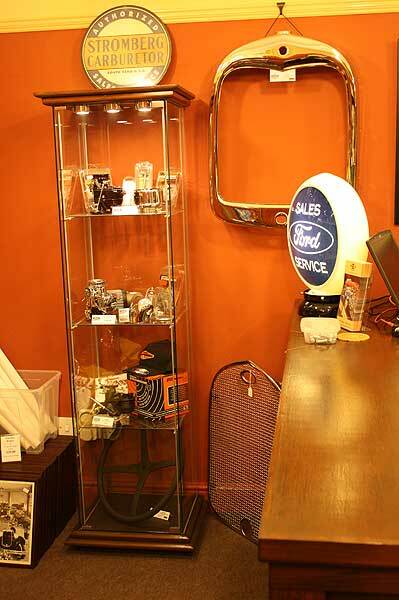 I thought we were running out of room at one point, as the counter was gradually moving further and further down the shop to make room for all of the parts shelves, but in the end, it fitted with plenty to spare. As we sell the full range of Ford factory prints, I wanted to have a picture gallery in the showroom, so we allocated the wall next to the phaeton for this. Believe it or not, we had to have every frame custom made, because you cannot buy ready made frames over here, in inches. Yes, the metric world even throws us when we want to frame our USA prints. This entry was posted in Uncategorized on March 9, 2014 by David O'Neill. 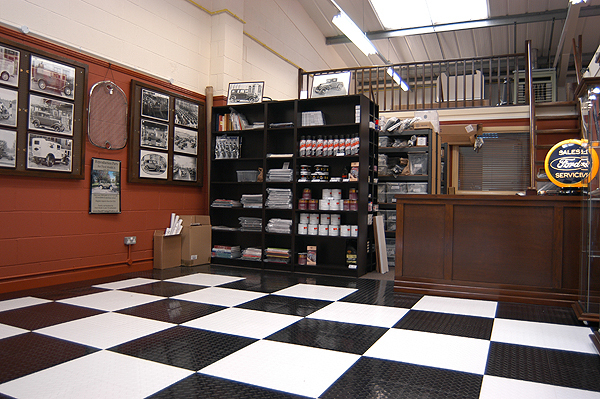 Yes, on Sunday 22nd December, we start to move all of our store to our new premises a few miles up the road, in Coalville, Leicestershire. 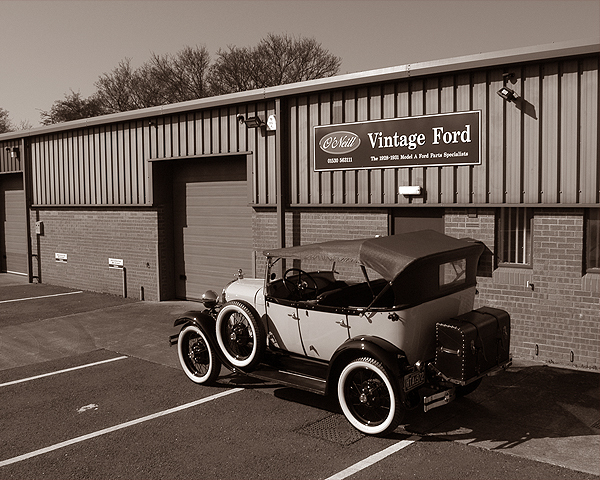 We really enjoyed having our homely vintage Ford shop in the centre of the market town of Ashby de-la Zouch, but we simply need more room. 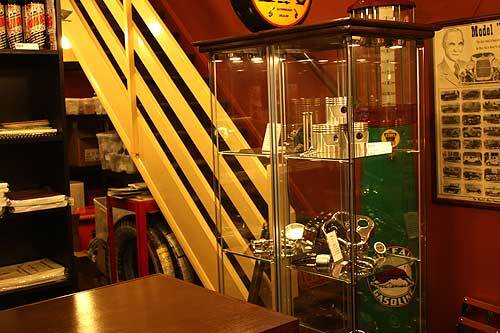 Before we leave, we thought it a good idea to take some photos of our store, so here they are. 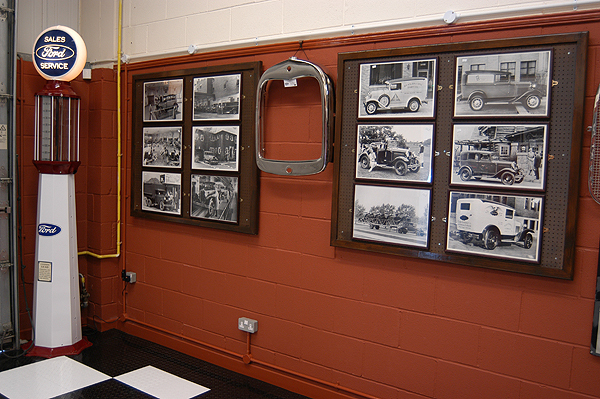 We are going to try and recreate the same 1930’s theme in our new premises and also add a Model A into the showroom. We will post pictures as soon as we are sorted out. This entry was posted in Uncategorized on December 21, 2013 by David O'Neill. A stranger in our store! A stranger appeared on our counter the other day. Yes a huge Boyds Christmas Teddy Bear. 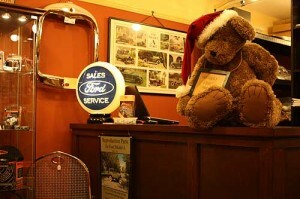 OK, the culprit was Angela, who brought him in from next door, where our sister company “Ashby Bears” lives. She said that we had to get some Christmas cheer at the parts counter and before you ask, he is not for sale. He is part of our annual Christmas display at Ashby Bears. 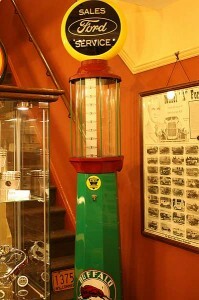 Boy, the NEC show was massive this year. Bob and myself were completely worn out, checking out everything there was to look at. 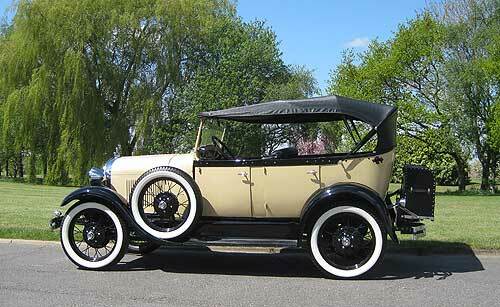 The Model A Club of GB did not have a huge stand this year, but I was pleased to have our 29 Phaeton on the stand. 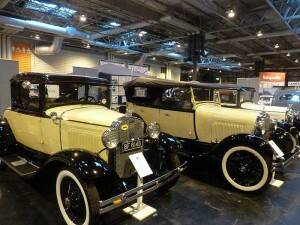 (Picture features Bob Collett’s 30 coupe on the left and our 29 phaeton in the centre). This entry was posted in Uncategorized on November 21, 2013 by David O'Neill. 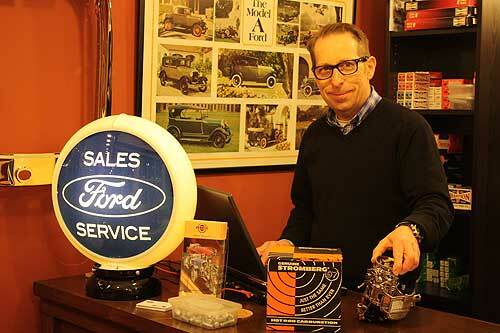 We have just had our first delivery of the newly re-tooled headlamp reflectors for the Model A Ford. 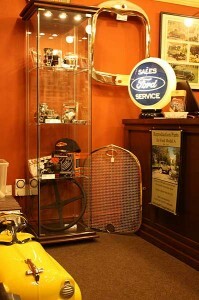 This has been a two year programme of development by one of the major USA Model A parts suppliers. This entry was posted in Uncategorized on November 15, 2013 by David O'Neill. This weekend sees the annual classic car show at the NEC. Last year saw one of the biggest shows ever, so expect the same this year. 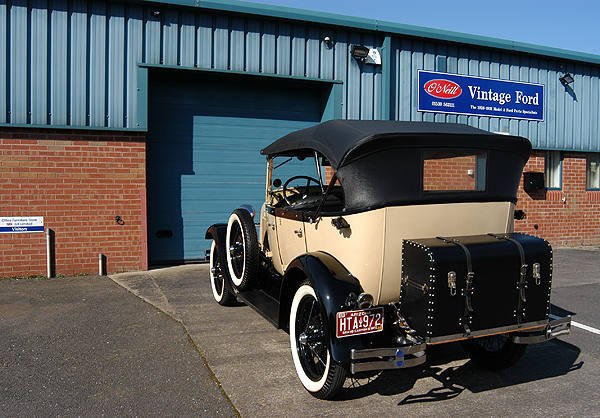 We have been asked by the Model A Ford Club GB, to exibit our 1929 model A Phaeton on the MAFCGB stand, which we are honoured to oblige, although the weather is not looking too promising for the drive down there. 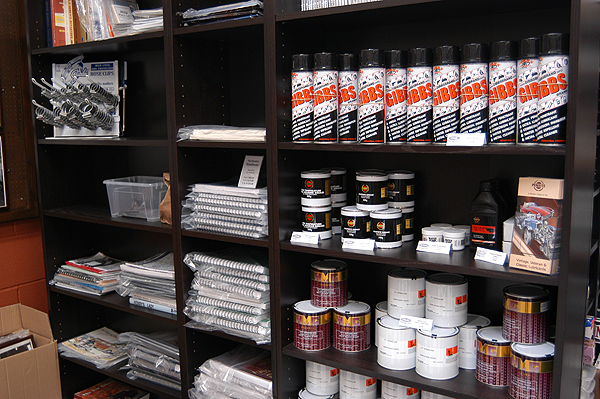 Oh well, it looks like we will be bringing the buckets and sponges, together with plenty of polishing materials. This entry was posted in Uncategorized on November 14, 2013 by David O'Neill. 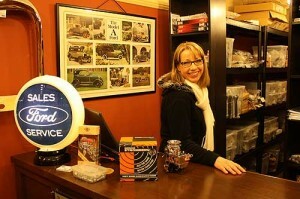 Gibbs Brand Lubricant back in stock! 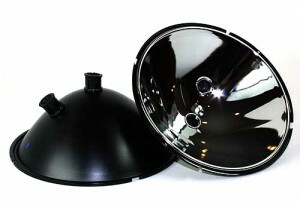 One our most popular products. This entry was posted in Uncategorized on October 13, 2013 by David O'Neill.